Barbara’s love affair with raw food started in 2008 at the Raw Food School in Glastonbury, England. “The food tasted so fresh and full of flavour, I was hooked. I started juicing, making green smoothies, and experimenting with raw recipes. The results far exceeded my expectations – weight loss, clear skin, and flexibility. The disappearance of eczema, aching, stiff joints and gum disease, surprised and delighted me. Because it increases suppleness and calms the mind, fresh, organic raw food has enhanced her regular yoga practice. She is a keen exponent of fermented foods and drinks to boost the digestive and immune systems. 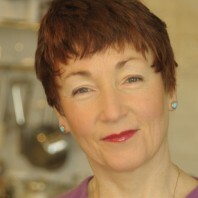 In June 2014 Barbara qualified as a health coach with the Institute of Integrative Nutrition, New York (http://www.integrativenutrition.com/). Her philosophy is to keep it simple and pure, eat real food, and use local resources and suppliers whenever possible. Her approach is holistic – working with Nature rather against it. She uses wild food and fresh herbs from her garden and has planted a forest garden to supply the freshest, most nutritious food for little or no cost, and minimal work. She is constantly updating her knowledge. If you’d like to know more sign up for a demonstration or book a one-to-one consultation email barbara@eatrawfeelgreat.co.uk or phone her on 028 44 881 683.